When it comes to electrical appliances that help you become a better quilter, your iron is second only to your sewing machine. As boring as it seems, your ironing technique is critical to the quality of your finished quilt products – the more care you take with your pressing, the better your quilts will be. Embroiderers will tell you that the back of your work should look as neat as the front when it comes to embroidery, and the same can be said for quilting. Even though nobody will see the back of your quilt blocks once they’re in a quilt sandwich, it is important that they are as neat as possible. The reason for this is that it helps the blocks lie as flat as possible, which makes them sit better in the finished quilt and makes the quilting process easier. Of course, like anything with quilting, there are differing opinions on proper pressing techniques – steam or dry?, open or to the side?, press or iron?.... And there are no hard and fast rules, there is a time and a place for all these things. Let’s begin with your ironing set up. Start with the best iron you can afford. A cheapy from the supermarket isn’t going to perform as well, or last as long as a top quality iron. Look for brands you’ve heard of, the ones who have been making irons for years and treat your iron as a quilting investment. Also choose the biggest, sturdiest ironing board you can find. I like extra wide, and if you can find one that is long enough to fit a full width of fabric on it, you’ll save time. Again, it’s worth spending the money on a quality board. Ironing board covers may need to be replaced fairly regularly, this can be done relatively cheaply. Just pop your new cover straight over the old one for extra padding. There are also some great tutorials online for custom made pressing tables if you’ve got the space. One of my favourite internet hacks was to make a pressing table from a folding TV table – it’s handy to have a portable pressing table you can put next to your machine when you’re piecing blocks and need to press lots of seams. The difference between pressing and ironing is critical when quilting. Ironing involves pushing the iron across the fabric, flattening it as you go. Fine for clothing but it can cause distortion with quilt blocks. Pressing involves placing the iron down on a section of fabric, holding it to flatten the area, then lifting it up again and moving to the next area – you are not pushing across the fabric, causing stretch. Occasionally you might iron large pieces of fabric to get creases out of them, but for the most part it is important to press rather than iron. seams, you should be pressing them in place before you add the next step. If you need to unpick a seam, reach for the iron again – set the seam flat again before unpicking, and then press it flat after ripping the stitches. And beyond block construction, you should also press all your border and sashing fabrics, as well as your backing fabric. Batting benefits from a good press (this can be done straight on the floor when it’s a quilt sandwich). Press your quilt top well before basting it also. And binding is obviously pressed as it’s being made, but if you also press it over after you’ve sewn it down on one side of the quilt you’ll also get a crisper finish. This comes down to personal preference. Some people prefer a steam iron, others like a dry iron with a spray bottle of water handy. Sometimes steam can burn your fingers, particularly when pressing seams open, so this is a good time to reach for the bottle of water. Starch is another personal preference. I love a good spray of starch, particularly with fiddly little blocks and English paper piecing, when I want a really crisp seam. A spray of starch gives a nice finish to any block. Spray your block liberally, then give it a bit of time to air dry, then iron it. One thing to note: starch build up on your iron’s sole plate can transfer to your fabric, causing marks, so it’s important to wipe down your iron regularly. open or to the side? There are few controversies in the quilting world as great as which way to press your seams. Traditionally, it’s said that pressing to the side reduces pressure on the seams, but it is increasingly common to press open, too. Our rule of thumb is to do what is required for the block. I love how flat half square triangle units sit when pressed open, but most of the time I press to one side as I find it quicker and easier. You’ll often hear about pressing to the dark side (say this in a Darth Vader voice for full effect). The theory here is that the seams from dark fabrics will show through more on light fabrics, even with the buffer of the light seam allowance first. Pressing seams open eliminates this quandary, but it is worth taking the time to see if you need to press away from the light. If you plan to hand quilt, you need to decide how you’re going to quilt before your press – if you plan to quilt just inside edges, you’re going to want as little seam bulk on those seams as possible. In the interest of public education, I test made two simple nine patch blocks. For one, I pressed the fabric before I cut, set every seam, carefully pressed as I went and made note of how my pressing affected my seams. The completed block sat very flat with perfect seam intersections and a neat back. The other didn’t see the iron at any stage, and I didn’t pay attention to how the seams were sitting as I sewed over them. Even when I pressed this second block at the end, it wouldn’t sit straight and would be difficult to quilt over in a finished quilt, even if you couldn’t see how horrible the back looked. Agree that a good iron is a must; I am having difficulty finding a good one that lasts and performs through 3 hour per day quilting sessions. Any suggestions? Hi, everybody, nice to see you. I think it is a great article. Thank you so much for your comment! We love to hear from our readers. 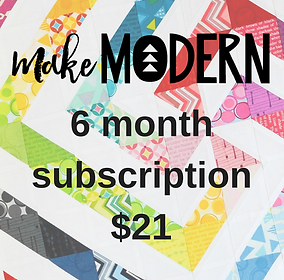 Make Modern is Australia's modern quilting magazine, written by a team of Australian quilters. We publish a bi-monthly digital magazine with over 100 pages, 10-14 modern quilt patterns sourced from talented pattern designers from Australia and overseas, and 12 feature articles which include stories from the quilt community, interviews with designers and quilt know-how. Sound good? 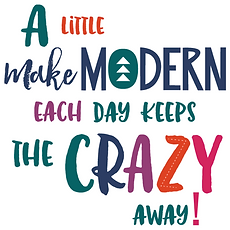 We're digital so no matter where you are in the world, you can subscribe and join in the modern making fun!